Following beautiful trails through rolling farmlands, forests and sleepy country villages steeped history well off the beaten track (you won't see another tourist from day you leave Pitigliano til you arrive in Orvieto at the end) the La Tuscia walk is a Hidden Italy special! 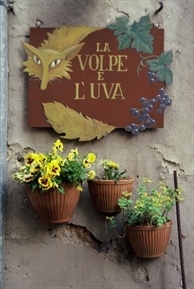 The tour starts in the 'three lost villages of Tuscany' and finishes in the spectacular Umbrian town of Orvieto. On the way you follow paths that pass cross the heart of ancient Etruria, following stretches of the Via Francigena, the original stone road that carried pilgrims, merchants and crusader armies from Papal Rome to northern Italy and the rest of Europe. This is a Grade 3 Walk (click here for details). The walks range from 8 to 18 kms. It starts with shorter walks for the first couple of days, finishing with longer walks at the end up to Orvieto. It mostly follows unsealed country roads through undulating farmlands. There are a couple of rougher sections which follow small but clear trails. Generous breakfasts are included each day (you'll need them for your walks). With notice, the hotels wil be able to prepare a cut lunch for the walk. Dinners are not included in the standard tour, however, if you select the 'Dinners option' (which we recommend) this will include 3 course meals in some of the finest restaurants in the area. The dinner option also means you'll have a guaranteed booking each night. Interested in the 2. Central Italy: La Tuscia, walking from Pitigliano to Orvieto Self-Guided Walk? This 7 day walk from Tuscany to Umbria can be personalised to meet your interests and travel dates. "We had a marvellous time and really appreciated how good it actually was to be in "hidden Italy" among the Etruscans and off the beaten path ... It was a beautiful walk at just the right level of difficulty for us and always most interesting." Find out a little more about the 2. Central Italy: La Tuscia, walking from Pitigliano to Orvieto tour by reading some of our most frequently asked questions.